READING, United Kingdom, Mar 23 2018 (IPS) - Greenhouse gases are produced as a by-product of the use of fossil fuels to supply light and heat, produce food, manufacture products and transport people and goods. These gases congregate in the upper atmosphere and result in global warming through absorption of sunlight reflected from the earth’s surface. At the 21st meeting of the Parties to the UN Framework Convention on Climate Change in Paris, it was agreed to limit the average increase in global temperature to 2°C . The easiest way of reducing energy consumption is to use it more efficiently. The most visible example of increased energy efficiency has been that of lighting where over a period of 30 years, the efficiency of light bulbs has increased by changing from incandescent filament lamps to compact fluorescent lamps and most recently light emitting diodes (LED). This measure has been successful because no change in usage is required and the most inefficient lamps (incandescent) can no longer be sold . The 80% increase in efficiency has resulted in a 10% electricity saving per household or 75 TWh across the European Union (EU). In addition the life of these lamps has increased by a factor of 10 from 1,000 hours to 10,000 hours thus saving energy on manufacture and reducing the amount of waste products. The introduction of the energy label by most countries including the European Union , has not only enabled the purchaser to buy a product closest to their needs, but also to consider buying a product with reduced environmental impact.Whereas the initial application was to appliances such as fridges and freezers, further applications have included electric motors, fuel consumption of cars and energy consumption of buildings. Rather unexpectedly, the energy label has also had a significant impact on manufacturers as they have decided to use the information on the label to market (and differentiate) their products. For example the EU introduced in 2012 a label to characterise the properties of individual tyres . This label not only displays information about fuel efficiency, wet grip and audible noise emissions, but also the current noise limit of 72 dB and the future limit of 68 dB. 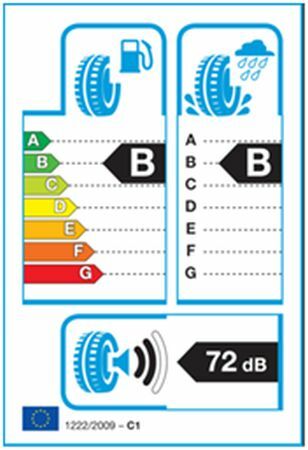 This information has enabled some manufacturers to produce tyres today emitting only 68 dB. The beneficiaries of this labelling initiative are those who live alongside busy roads but who do not themselves benefit from passing traffic but only suffer the disturbance. Decarbonising the heat supply is essential and a very efficient way is to concentrate the low grade heat present in the air, water or ground, Such systems called heat pumps can produce up to four units of heat for every unit of energy consumed  and so can provide space and water heating for domestic, commercial and industrial purposes. The additional benefit is that heat pumps reduce the demand for fossil fuels, which are rapidly being depleted, and also reduce the carbon emissions associate with the burning of fossil fuels. Container terminal showing quay cranes unloading and containers waiting to be transported to their destination. Credit: Rayner Mayer and William Holderbaum. Since the first containers were shipped in 1956, globalisation of production has steadily increased with products manufactured in one country, then distributed and sold in other countriesworld wide. Current shipment of containers is 700 million units a year  and each time a container is moved, energy is consumed on lifting (figure 2). Increasing energy efficiency has generally multiple benefits which include not only saving energy, but also reducing carbon emissions and reducing the demand on hydrocarbon resources and electricity supplies. It therefore needs to be encouraged and relevant authorities should promote strategies and policies which will encourage their uptake.